A healthier yet tasty version of spring rolls that are perfect for summer. The other week I cooked a spaghetti squash to enjoy as a healthier version of spaghetti. 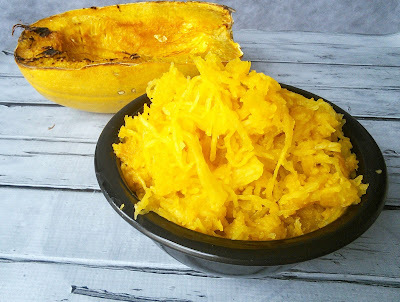 Since no one else in my family likes spaghetti squash, I had plenty of leftover cooked squash. I ate some of it with green chile sauce and that was so delicious but I needed to finish up the rest. 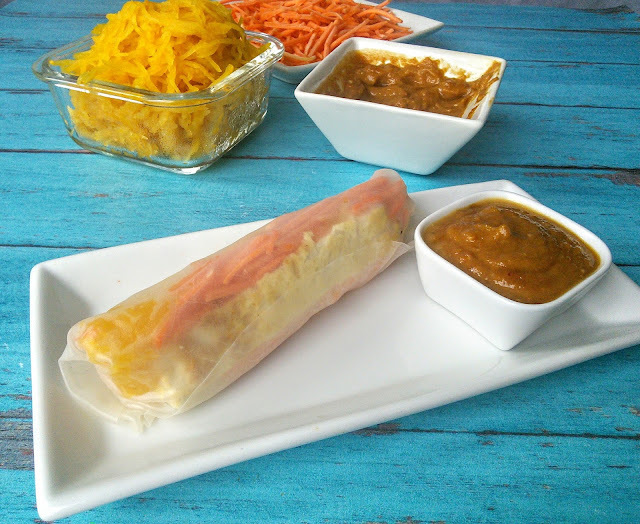 We had just had Chinese food the other day and I was craving egg rolls so I decided to see how the spaghetti squash would taste in a spring roll for a healthier egg roll substitute. I had a package of rice papers in my pantry and tofu in my fridge along with some shredded carrots that were leftover from my sushi burritos that we had for lunch on Sunday. So all I needed was a peanut butter sauce that was easy to whip up with soy sauce and crushed red pepper. I like saving those packages of red pepper that we get from the pizza place as they are great to use in recipes. So I made my spring rolls with spaghetti squash instead of rice noodles and I was pleasantly surprised at how awesome they tasted. You must try these as the squash not only makes these spring rolls lower in calories but it adds way more nutrition than the rice noodles. I am now on a spring roll kick for healthy summer meals. To make these spring rolls, you need to get some rice papers. I usually get mine at Talin Market in Albuquerque. I just love this international grocery store. I always leave this store with new unique ingredients as this place inspires me to create new recipes. You will also need the spaghetti squash, tofu, and other ingredients. I like using extra firm tofu in my recipes as it has the best texture for pan frying. The first thing that you need to do for this recipe is to cook the spaghetti squash and that is so simple to do. Wash the squash and cut it in half, lengthwise. Then get all the seeds out, sure you could leave them in but they are a pain to get out once the squash is cooked. Then turn on the oven to 375 F and lightly brush some olive oil on the inside of the squash. Place the two pieces of squash, flesh side down, on a baking sheet and cook for 40-60 minutes or until tender. Let the squash cool down and then using a fork, scrape all the squash out. I just love how it resembles spaghetti noodles. While the squash is cooking, you can pan fry the tofu and make the peanut butter sauce. Once all your ingredients are prepared, it is time to assemble the spring rolls. I like to have all my ingredients close by and ready as once you get the rice paper wet, you have to roll them right away. Take a rice paper and gently dunk it into a bowl of warm water for a few seconds. Shake off the excess water and place the paper on a plate. 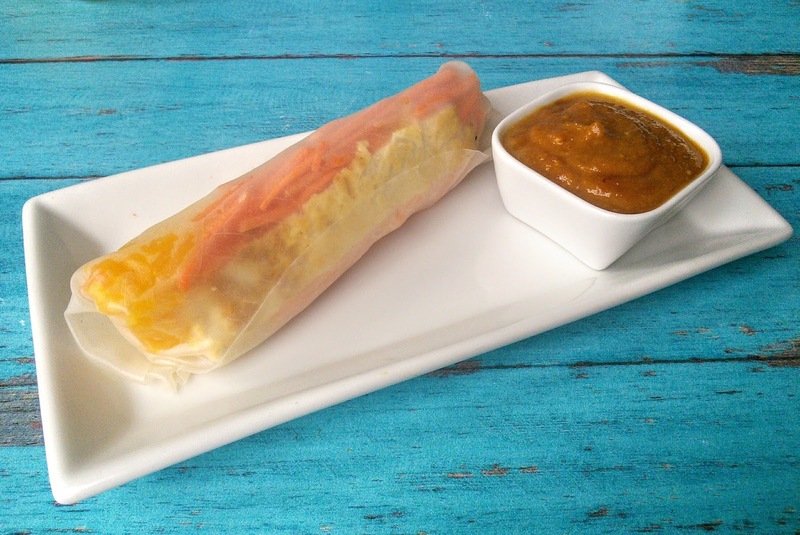 The rice paper won’t softened right away, but once you lay it on the work surface and put your fillings, it will be soft and ready to be rolled. Place the squash, carrots, and tofu in the middle of the rice paper. Then roll it up like a burrito. Work quickly so the paper does not get soggy. Your first rolls may look funny but after making a few, you will get the hang of it. Make sure not to overstuff the rice papers as it will be hard to roll. 1. Preheat the oven to 375°F. Line a baking sheet with aluminum foil. 2. Half the spaghetti squash and remove the seeds. Lightly spread the olive oil on the flesh of the squash. Place the squash halves flesh side down on the prepared baking sheet. Bake for 40-60 minutes, or until fork tender. Cool the cooked squash until safe to handle. 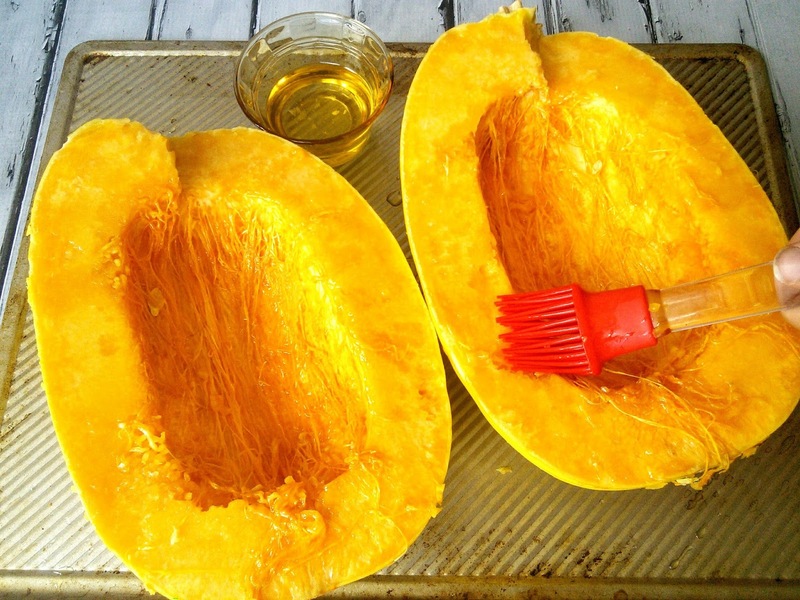 Run a fork to separate the strands and scoop out the squash into a bowl. Cool completely. 3. While squash is baking, cook the tofu. Cut the tofu in half and pat dry with paper towels to get some of the moisture out of it. Heat the 2 tablespoons of oil in a medium pan and add the tofu slices. Cook for 1-2 minutes on each side or until crispy and brown. Place the tofu on paper towel to absorb the oil. Then cut the tofu into strips. 4. Fill a large bowl with warm water and assemble the rice papers, cooked squash, carrots, and tofu strips around a large plate or cutting board. The plate or cutting board will be your work surface to roll the spring rolls on. 5. Submerge the rice paper completely into the warm water for a couple of seconds. Then allow the excess water to drip off. 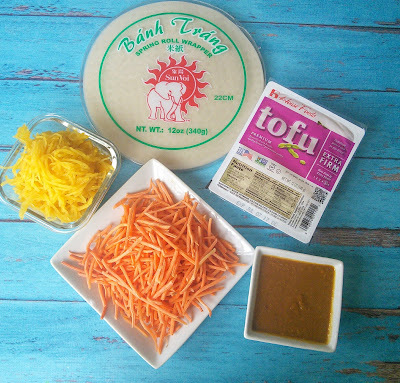 Place the rice paper on the plate and arrange the spaghetti squash, carrots, and a tofu strip in the middle. Fold the two sides first, and then tightly, but carefully roll the wrap like a burrito. Place the finished roll on a plate and repeat the steps until you use all the rice papers. 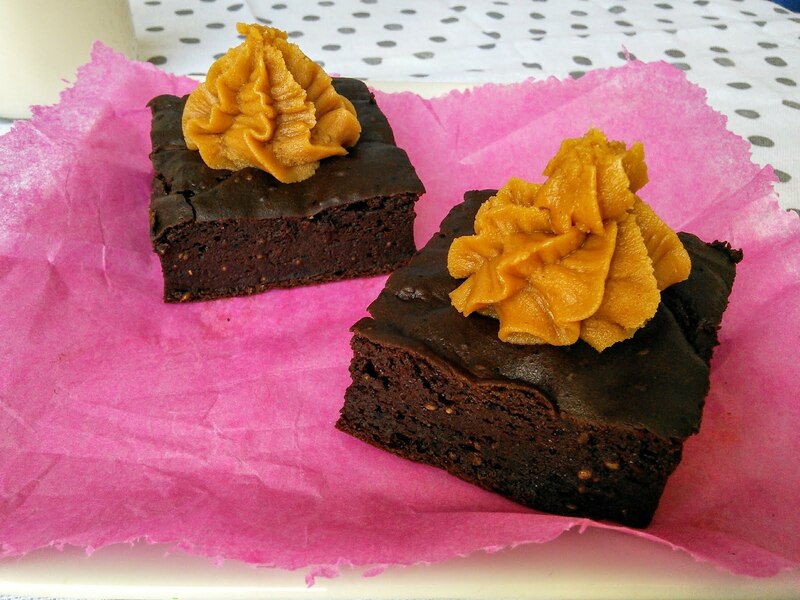 If you have extra ingredients, just place in the fridge for another day. 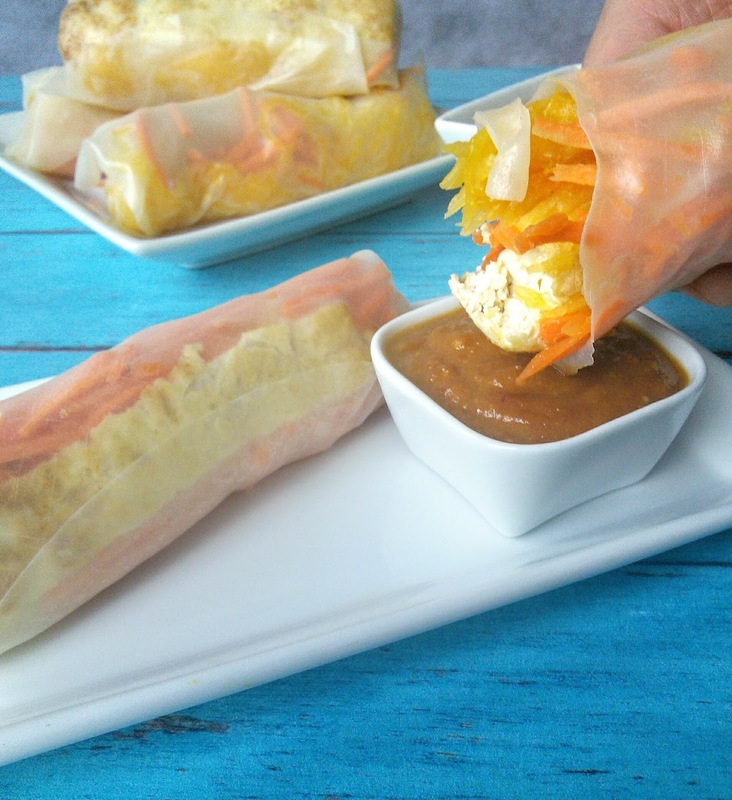 Dip the spring rolls into the peanut butter sauce. If you will be not eating the spring rolls right away, wrap them individually in plastic wrap. These springs rolls are excellent for packing in a lunch. 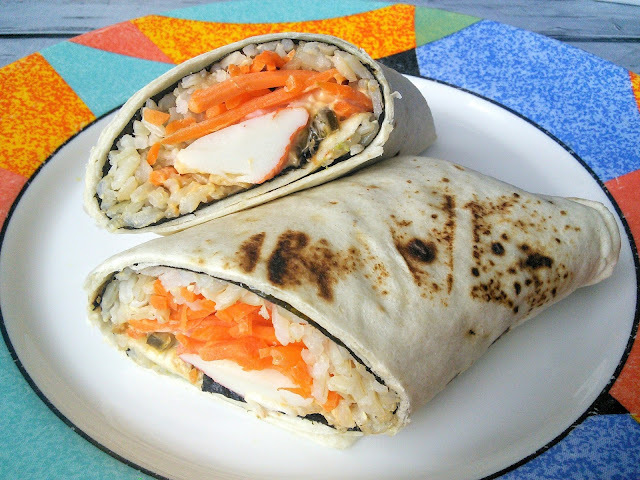 To use up the rest of the shredded carrots check out my recipe for Sushi Burritos. Oh yummy! 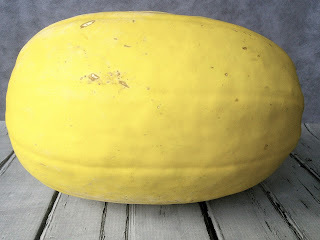 I wouldn't have thought to use spaghetti squash this way. Thanks for sharing on #TastyTuesdays. Yum – thanks for sharing your recipe with us over at the Creative K Kids' Tasty Tuesday & I hope you'll join us again this week!